Site Administrators may now link leadership positions to security roles. This will cause any member who currently holds that position to be automatically authorized for that user role, if they were not authorized for it before. Any authorizations added by this mechanism will be removed once the leadership position ends or is removed. However, any roles that were assigned manually from the Users & Passwords page will be unaffected by changes in leadership position. This has a drop down list containing all of your site's user roles. You may choose one role from the list. Then click Save & Exit to save this selection. The selected user role will be immediately added to the user IDs of any member who currently holds that position. 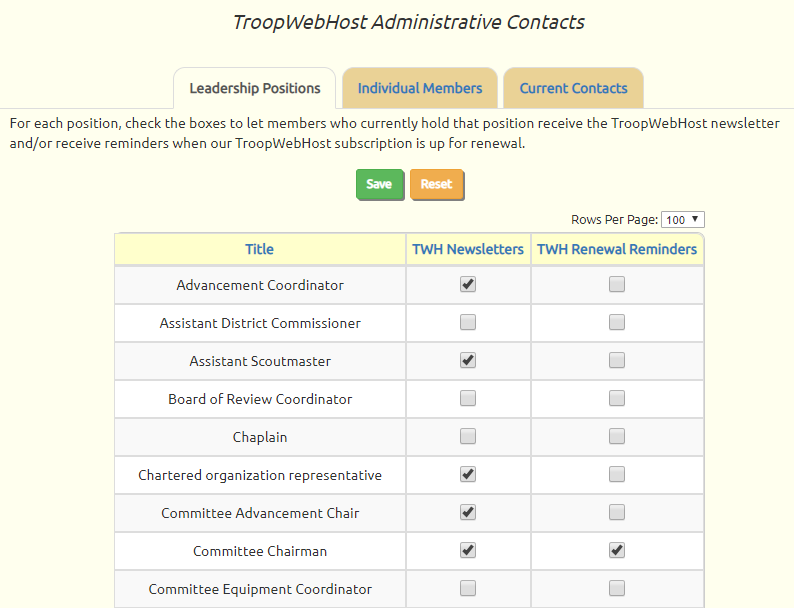 These settings allow you to designate your TroopWebHost Administrative Contacts based on leadership positions. This can be used to ensure that your treasurer always receives reminders when your subscription is up for renewal, and that other leaders receive our monthly e-mail annoucing this newsletter. The first tab lets you set these flags on all adult leadership positions. The second tab lets you select individuals who should always receive these notifications, regardless of their current leadership position. The third tab lists all of your current TroopWebHost Administrative Contacts, and shows you individuals that have opted out of these notifications (see below). This allows any member of your troop to sign up to receive these notifications. These "opt out" selections will override the leadership settings for this individual, preventing them from receiving these communications. The Rechartering chapter of our User Guide has been rewritten to reflect the way we've revised this process. 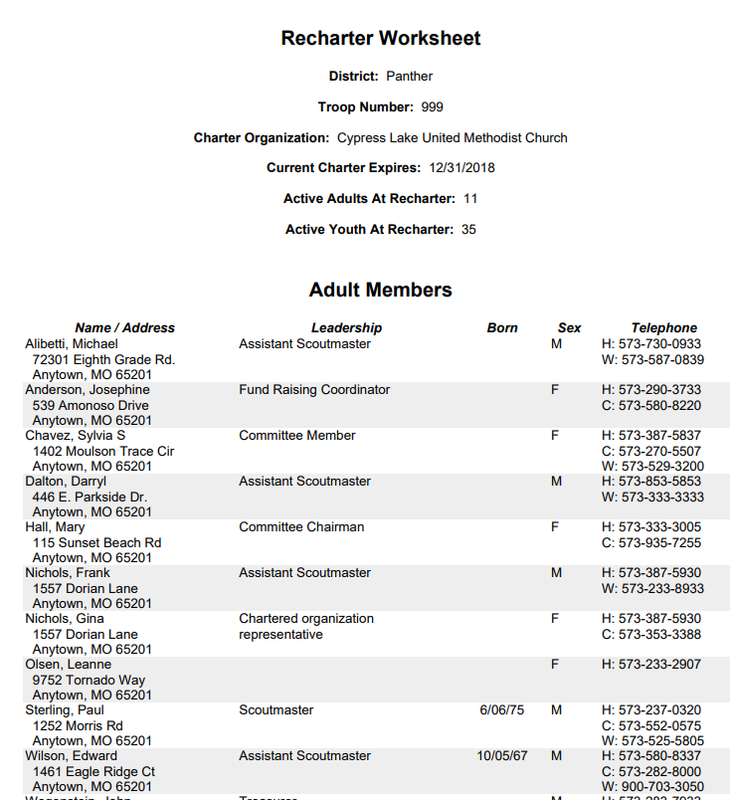 The system will automatically select the members to include in this charter year. All active scouts will be included, as will all adult members who currently hold a leadership position or who have a BSA ID on their membership record. You can override those selections on this page. 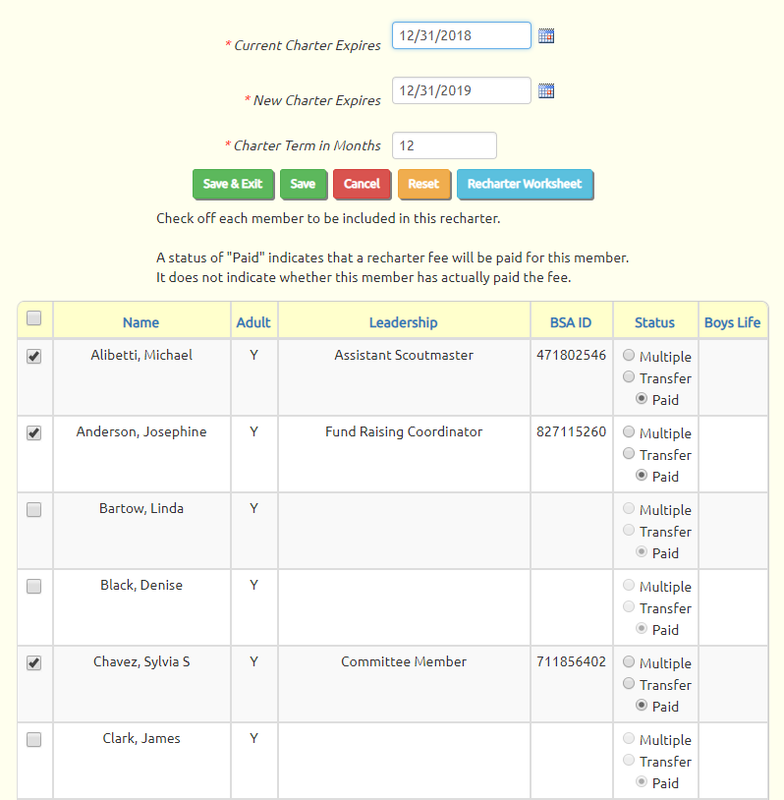 For each member you can indicate their status as of the new recharter year, which will be "Paid" for most members to indicate that a recharter fee will be paid for them. Members who pay their fee through another scouting unit will be flagged as "Multiple", while members who paid at a previous troop for this year should be set to "Transfer". For scouts you can indicate whether they subscribe to Boys Life. This will be pulled from the current setting on their Membership record. Similarly, when you Export the ScoutNet Recharter File the system will select those members that you included in this recharter year. The ScoutNet-compatible Recharter File can be a real time-saver, as it allows you to electronically transfer your unit's recharter data to your council's website. The Site Appearance page now lets you select a maximum image resolution of 1200 pixels per side. This will apply to all new photos uploaded to the Photo Gallery. Please be aware that, on some devices, the Multiple Photo Upload option may not work well at the higher resolutions. We urge you to experiment to see which setting works the best for your group. The Booth Sales feature allows you to accept cash, checks, and credit cards at on-site fundraising events. A record of each Booth Sales event is available at Sales → Merchandise Booths. 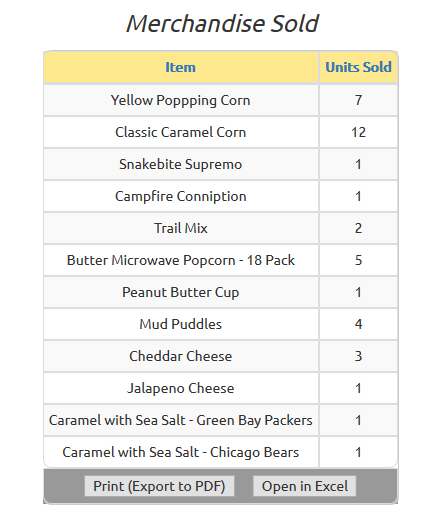 This page now includes a section that displays a summary of the products sold at that booth. Send us a ticket from the My Support Tickets page on your site's Help menu. This is absolutely the best way to communicate with us! Or simply contact us at CustomerSupport@TroopWebHost.com. If you do, please include your troop number and city in your message so we can identify your site.